Lanyards Produced by ASD - 10,000 qty. Lanyards Produced by ASD - 2,500 qty. Lanyards Produced by ASD - 20,000 qty. Lanyards Produced by Sponsor - 2,500 qty. What’s the biggest thing on the show floor? The aisle carpet tile. Stand out from the crowd. 5’W x 2’6"H, single-sided floor decal. If you wish to discuss placement options before purchasing, please contact your ASD Market Week Account Executive (AE), or your AE will reach out after purchase to finalize placement. Sponsor agrees to create and submit artwork by the deadline specified by ASD Market Week. The artwork specifications sheet and deadline will follow via email. If print-ready artwork is not provided timely, it may jeopardize the ability to produce the item in time for the show, and rush fees for expedited production may apply. ** The product image is shown for illustration purposes only and may not be an exact representation of the product. Includes 1,000 pens to be placed on the counters at registration in the hall of sponsor's choosing. Sponsor agrees to create and submit artwork by the deadline specified by ASD Market Week. The artwork deadline and submission information will follow via email. If artwork is not provided timely, it may jeopardize the ability to produce the item in time for the show, and rush fees for expedited production may apply. Helping move 45,000+ attendees around 700,000 sq./ft. of exhibit space just got easier with this handy fold-out map. Your advertisement will be prominently displayed on one of 4 available spots. This is a great space to advertise an incentive like a give away or free product sample. Sponsor must create and email artwork no later than 7/5/19 to leslie.patko@emeraldexpo.com. Ad size: 3.875”Wx1.5”H (non-bleed). 300 DPI CYMK. File formats: HIGH-RES PDF, EPS, TIF. All fonts must be embedded/ converted to outlines." **The product image is shown for illustration purposes only and may not be an exact representation of the product. Place your company, product, and booth number on the most important email that every buyer will see! All pre-registered attendees will receive a badge confirmation email reminder 1-2 weeks out from the show, which re-confirms their registration at ASD Market Week. The badge confirmation reminder email is printed/or digitally kept by all attendees and brought to the Show in order to receive their badge. Your web banner, linking to your Online Show Planner will appear near the top of the registration confirmation email, above the barcode. Attendees use the floor plan, exhibitor list, and the product gallery to search for companies that they want to visit while onsite. This added exposure can increase your pre-show reach to attendees by 3-4 times! Just as you would not leave your booth empty and unstaffed on the exhibit floor, do not leave your online profile empty and uninviting. Take advantage of this opportunity to stand out from the competition, to build quality pre-show leads and to maximize your ROI from the event. Enhance your visibility to attendees and grow your business by selecting one of the digital promotion packages. Digital promotion packages increase your visibility with attendees 3-4 times more than with a standard online profile. Take this opportunity to showcase all of your products and services while increasing traffic to your booth on the show floor. Your Sponsor logo will link to you web page or your online profile. Be visible to an ever-growing mobile audience every time they use the web or native apps. As a Mobile App Title Sponsor your logo is displayed on the splash screen, as a top banner ad, and as a Clickable Navigation Item. All logos will be linked to your profile. You will also receive One Push Notification that will reach all mobile app users. Highlight your new product or booth events with custom push notifications. Limited to 8 exhibitors per day. The shared Landing Page is displayed after the Intro page. Maximize your exposure at the show with the Above Booth Banner. Your banner will be hard to miss as buyers navigate the show floor. 10'W x 10'H double-sided banner will hang above your booth space. Sponsor agrees to create and submit artwork by the deadline specified by ASD Market Week. The artwork specifications sheet and deadline will follow via email. If print-ready artwork is not provided timely, it may jeopardize the ability to produce the item in time for the show, and rush fees for expedited production may apply. 10'W x 5'H double-sided banner will hang above your booth space. 20'W x 10'H double-sided banner will hang above your booth space. Includes banner opportunity only. Sponsor is responsible for their own banner creation. All fees, including labor and rigging, are not included. Sponsor must timely ship banner to Freeman and order labor through Freeman. Shipping information and Freeman order forms will follow via email after purchase. **The image is shown for illustration purposes only and may not be an exact representation of the product. Circle banner will hang above your booth space. 8’ diameter. Graphics: 301.6" W x 24" H.
Square banner will hang above your booth space. 4 sides, 8’W x 2’H each side. Triangle banner will hang above your booth space. 3 sides, 8’W x 2’H each side. Want to have a presence at ASD Market Week? You can with an Aisle Banners, located at the main cross aisles. Aisle Banners are the most utilized directionals assisting retail buyers and industry attendees walking the floor, giving your brand high visibility. 4'W x 4'H, double-sided banner. If you wish to discuss placement options before purchasing, please contact your ASD Market Week Account Executive (AE), or your AE will reach out after purchase to finalize placement. Make a big impression! These oversized graphics greet attendees as they enter our halls. If you wish to discuss placement options before purchasing, please contact your ASD Market Week Account Executive (AE), or your AE will reach out after purchase to finalize placement. Exhibitors are customers too! Optimize your presence at the show and take this as a unique opportunity to connect with the Exhibitors at the show. We will place your flyer at each booth before the opening of the show that day. One flyer distributed to exhibitors. Sponsor is responsible for production and timely shipment of flyer. Flyer subject to prior review and approval by ASD Market Week. "Hey DJ, keep playing that song." As buyers relax and listen to records spin with our live DJ, your brand will up front and center on the DJ stand. Your name and booth number will also be featured on one double-sided Meterboard. This opportunity is available only in the area(s) where a DJ will be scheduled to play during the show. If you wish to discuss placement options before purchasing, please contact your ASD Market Week Account Executive (AE), or your AE will reach out after purchase to finalize placement. Put your company name and booth number in the hands of buyers entering the exhibit hall with this branded Sponsorship. Includes 500 branded fans distributed at the entrance of one hall of the Sponsor's choosing (North, Central, South Lower, or South Upper) on one (1) selected show day. Sponsor may select one fan background color and a single imprint color. Work hard, play hard. Your company name and booth number will be featured on each half of a ping pong table top. This is a great opportunity to expose your brand to buyers looking for a friendly game of ping-pong with their peers. Featured in a lounge location. Clean up at ASD Market Week with this brand new opportunity! • The spray-on instant hand sanitizer helps you stay clean and healthy in a matter of seconds, even without water! • Spritz on your hands and rub in to instantly minimize the spread of germs. • Each spray tube holds 10 ml in your choice of Lavender scented, Coconut scented, Citrus scented or Unscented. • The customized sanitizer with clip is ultra-portable for use anywhere. • Includes a full color imprint on the white label. Sponsor agrees to create and submit artwork by the deadline specified by ASD Market Week. The artwork deadline and submission information will follow via email. If artwork is not provided timely, it may jeopardize the ability to produce the item in time for the show, and rush fees for expedited production may apply. Generate greater exposure in the exhibit hall by getting your postcard, brochure, or small SWAG item into attendees' hands as they enter the show floor. This exclusive opportunity allows you to extend your reach beyond your booth and draw additional traffic. ASD will provide one temporary worker to hand out brochures inside one hall (North, Central, South Upper, or South Lower) for four (4) hours on one (1) selected show day. If you wish to discuss available options for the day and hall before purchasing, please contact your ASD Market Week Account Executive (AE), or your AE will reach out after purchase to finalize those choices. Sponsor is responsible for production and timely shipping of the item to be distributed. Item subject to prior review and approval by ASD Market Week. Suggested quantity: 2,000 per day. Everyone needs a recharge now and then. Here is a great opportunity to get in front of buyers as they rest their feet and charge up their mobile devices on the show floor. Item to be placed in a lounge on the show floor. Branding included on both sides of charging unit. Generate interest with attendees as they charge their devices because let's face it, we all need a recharge now and then. Be the Sponsor that provides a service that everyone doesn’t know they need until it’s too late. Column Panels are a great way to get noticed by attendees as they make their way around the show. These large-scale graphic panels are hard to miss and another way to promote your products along with your booth number, so buyers are reminded to visit your booth. Here is your chance to reach crowds in a big way: an 8-second advertisement that will be shown repeatedly on 14 screens in high-traffic lobby areas throughout the entire Convention Center. This includes the giant screen in the Grand Lobby and the impossible-to-miss screens over the busy escalators in the South Hall lobby. Your ad will show simultaneously on all of these screens a minimum of 100 times per day during all 4 days of the show. Your 8-second advertisement can be submitted either as a STILL image or as eye-popping MOVING images that you design to promote your product and drive traffic to your booth - imagine the possibilities! Sponsor agrees to create and submit artwork in five (5) different formats by the deadline specified by ASD Market Week. The artwork specifications sheet and deadline will follow via email. If artwork in the correct format is not provided timely, it may jeopardize the ability to format the item in time for the show, and rush fees for expedited production may apply. Insert a custom collateral piece inside each copy of the ASD Market Week Show Directory. Promote a show special, new product, special program and booth location. Quantity: 20,000; quantity subject to change. Sponsor is responsible for production and timely shipment of directory insert. Insert must be no larger than 5.5" x 8.5". Grab the attention of buyers with your hottest products as they make their way down the main aisles. These Display Pedestals can sell out quickly, so grab your spot today! Sponsor will have access to a Display Pedestal. Sponsor agrees to abide by the Display Pedestal Regulations. Sponsor must provide product and set up Pedestal on the first day of the show between 7:30 a.m. and 9:00 a.m. Product must be picked up on the last day of the show between 3:00 p.m. and 4:00 p.m. Any items left behind at that time will be property of ASD Market Week. Showcase your product in a high-traffic area to get your product in front of ASD Market Week buyers. This is a great opportunity to feature your product in a secondary location to help drive traffic back to your booth. Two Sponsors per Display Tower required to participate. Sponsor will have access to two shelves in a Display Tower. Sponsor must provide product and set up case on the first day of the show between 7:30 a.m. and 9:00 a.m. Product must be picked up on the last day of the show between 3:00 p.m. and 4:00 p.m. Any items left behind at that time will be property of ASD Market Week. Get your message in the faces of attendees as they wait for the elevator or board the escalators with branded clings on the elevator entry doors. These are placed in a very high-traffic location near the top of the escalators in the South Hall, Upper Level lobby. Use your functional advertising space to illustrate your brand, promote your product, and drive traffic to your booth. 4'W x 5'H graphic across one set of elevator entrance doors, divided in the middle. Escalators provide the most convenient access from one hall to another within the lobby. This is your opportunity to display your company’s ad and booth location on a prominent runner between the escalators, while achieving maximum brand exposure to ASD Market Week attendees. Elevate sales with this brand new opportunity! Elevate sales with this brand-new opportunity! Includes one 44" wide x 22" high single-sided cling on the glass at the entrance to an escalator in the busy South Hall lobby. Sponsor agrees to create and submit artwork by the deadline specified by ASD Market Week. The artwork deadline and submission information will follow via email. If print-ready artwork is not provided timely, it may jeopardize the ability to produce the item in time for the show, and rush fees for expedited production may apply. **The product image is shown for illustration purposes only and may not be an exact representation of the product. Hey! Watch where you're stepping! Place your brand at the "feet" of buyers on the escalators in South Hall. Our escalators provide the most convenient access from one floor to another. This is your opportunity to display your company’s ad, while achieving maximum brand exposure to thousands of attendees! ** The product image is shown for illustration purposes only and may not be an exact representation of the product. Price is based on per/step. Image below represents 7 steps. Get your name and booth number in front of buyers who use our Golf Carts to ride in style from North Hall to South Hall and back again! Includes Sponsor logo on double-sided cart topper. Let us do the work while you stand out from the competition with this new opportunity! ASD will produce 10,000 lanyards to be distributed to registered buyers at registration locations in the hall of sponsor's choosing while supplies last. Hall selection subject to availability. Sponsor agrees to create and submit artwork by the deadline specified by ASD Market Week. The artwork deadline and submission information will follow via email. If print-ready artwork is not provided timely, it may jeopardize the ability to produce the item in time for the show, and rush fees for expedited production may apply. ASD will produce 2,500 lanyards to be distributed to registered buyers at registration locations in the hall of sponsor's choosing while supplies last. Hall selection subject to availability. Sponsor agrees to create and submit artwork by the deadline specified by ASD Market Week. The artwork deadline and submission information will follow via email. If print-ready artwork is not provided timely, it may jeopardize the ability to produce the item in time for the show, and rush fees for expedited production may apply. ASD will produce 20,000 lanyards to be distributed to registered buyers at registration locations in the hall of sponsor's choosing while supplies last. Hall selection subject to availability. Sponsor agrees to create and submit artwork by the deadline specified by ASD Market Week. The artwork deadline and submission information will follow via email. If print-ready artwork is not provided timely, it may jeopardize the ability to produce the item in time for the show, and rush fees for expedited production may apply. Designed and manufactured by you, worn by ASD Buyers to promote your company and booth location! Sponsor will provide 2,500 lanyards and ship them timely to the Freeman warehouse by the Advanced Warehouse cutoff date. Lanyards must have double bulldog clip attachments. Sponsor is responsible for all production and shipping costs. Lanyards will be distributed to registered buyers at registration locations in the hall of sponsor's choosing while supplies last. Hall selection subject to availability. Maximize your exposure with a high-visibility, large-scale Lobby Banner in a high-traffic location as buyers walk through the front doors of the convention center and into the lobby. 10'W x 4'H single-sided banner. If you wish to discuss placement options before purchasing, please contact your ASD Market Week Account Executive (AE), or your AE will reach out after purchase to finalize placement. Maximize your exposure with a high-visibility, large-scale Lobby Banner in a high-traffic location in the South Hall, Upper Level lobby. ** The product image is shown for illustration purposes only and may not be an exact representation of the product location. Maximize your exposure with a high-visibility, large-scale Lobby Banner as buyers walk through the front doors of the convention center and into the lobby. 6'W x 12'H single-sided banner. If you wish to discuss placement options before purchasing, please contact your ASD Market Week Account Executive (AE), or your AE will reach out after purchase to finalize placement. Showcase your product in a high-traffic area to get your product in front of ASD Market Week buyers. This is a great opportunity to feature your product in a secondary location and help drive traffic back to your booth. Sponsor will have access to a Display Case. Sponsor must provide product and set up Display Case on the first day of the show between 7:30 a.m. and 9:00 a.m. Product must be picked up on the last day of the show between 3:00 p.m. and 4:00 p.m. Any items left behind at that time will be property of ASD Market Week. ** The product image is shown for illustration purposes only and may not be an exact representation of the product." Grab the attention of ASD Market Week buyers in the South Hall lobby with this large-scale floor decal located at the base of the escalators. As buyers make their way from one floor to another, this exclusive 10'x10' floor decal will result in maximum exposure of your presence at the show. This is a great opportunity for you to promote your brand, products, and booth number in a high-impact way as buyers make their way to their next destination. Time to play dress up. Show off your product on 3 mannequins (male or female) to be featured in one of our open lounge areas on the show floor. Sponsor agrees to have the mannequins fully dressed before the show opens at 9:00 a.m. on the first day of the show. The mannequins may not be moved from the designated area. Product must be picked up on the last day of the show between 4:00 p.m. and 5:30 p.m. Any items left behind at that time will be property of ASD Market Week. Meterboards are an effective, affordable way to communicate with attendees. These signs are strategically placed in key areas to generate brand awareness and promote your products. Everyone needs to eat. Choose to provide a popcorn machine, cookies, or snack mix. Includes the sponsor's name and booth number on one (1) double-sided Meterboard. Everyone needs to eat. Choose to provide a popcorn machine, cookies, or snack mix for all 4 days of the show. Includes the sponsor's name and booth number on one (1) double-sided Meterboard and branded napkins. 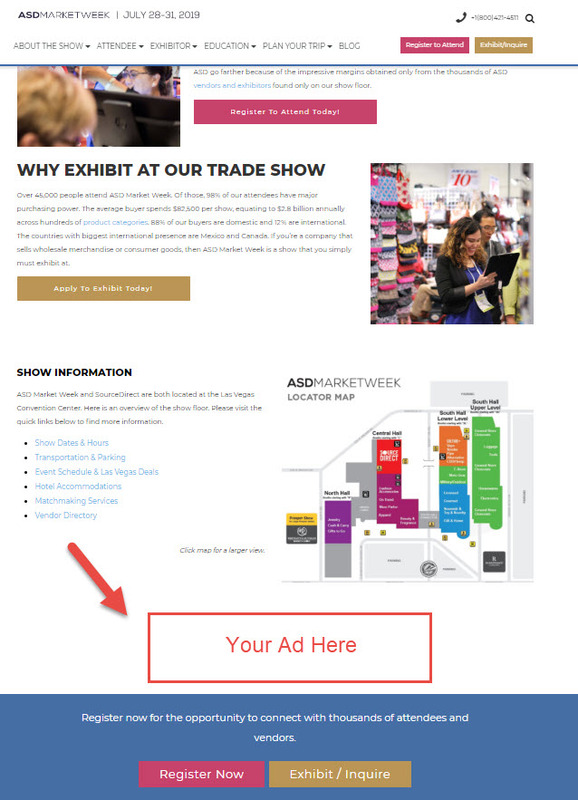 Advertise in the official Show Directory and get into the hands of ASD buyers and exhibitors. File Size: 4""x7.5"" (non-bleed). File Types: InDesign CS6, Illustrator and Photoshop; Mac files preferred. Include all screen and printer fonts with document, including those embedded in accompanying images (such as logos). All linking art must be at least 300 dpi CMYK. No RGB or JPEG images." Email ad NO LATER THAN June 12, 2019 to: gennie.kiuchi@emeraldexpo.com. Have your company name and booth number stand out from in sea of exhibitor listing in the Show Directory. Your company name and booth number will be BOLDED in the official Show Directory. File Size: 4""x7.5"" (non-bleed). File Types: InDesign CS6, Illustrator and Photoshop; Mac files preferred. Include all screen and printer fonts with document, including those embedded in accompanying images (such as logos). All linking art must be at least 300 dpi CMYK. No RGB or JPEG images. File Size: 4""x3.5625"" (non-bleed). File Types: InDesign CS6, Illustrator and Photoshop; Mac files preferred. Include all screen and printer fonts with document, including those embedded in accompanying images (such as logos). All linking art must be at least 300 dpi CMYK. No RGB or JPEG images. Your web banner, linking to your Online Show Planner will appear near at the footer of the registration confirmation email. All pre-registered vendors will receive a staff badge confirmation email reminder 1-2 weeks out from the show, which re-confirms their registration at ASD Market Week. The badge confirmation reminder email is printed/or digitally kept by all vendors and brought to the Show in order to receive their staff badge. Your web banner, linking to your Online Show Planner will appear at the footer of the registration confirmation email. Place your company, product, and booth number on the most important email that every vendor will see! Ad to appear run of site on sourcedirectshows.com (max. 5 ads in rotation). Sponsor to create and submit ad file as .jpg, .gif or .png along with URL to link ad. Limited to 5 companies for each ad space. Once ad materials are submitted, please allow 3-5 business days for ad to appear in the designated spot. All ads will run for one month. Due to extremely high demand, if ad materials are not submitted two weeks after sale date, space is considered forfeited with no refund. All ads will be removed after 2 weeks post-show no matter your start date. So please take into consideration show date. Email ad file and URL or any questions to adops@emeraldexpo.com. Reference "SourceDirect website - Ad placement." Email ad file and URL or any questions to adops@emeraldexpo.com. Reference "SourceDirect website - Ad placement"
ASDonline.com generates pre-show web traffic of over one million page views annually. With over 15,000 page views in a single day during peak times, your premium placement advertisement is guaranteed excellent exposure before the show. Take advantage of these limited opportunities and start making an impression on new customers today. Ad to appear run of site on asdonline.com (max. 5 ads in rotation). Sponsor to create and submit ad file as .jpg, .gif or .png along with URL to link ad. Email ad file and URL or any questions to adops@emeraldexpo.com, please reference ASD website - Ad placement.